When you see scenes of flames shooting into the sky, threatening homes and lives, it really underscores the extreme dangers firefighters face. But, there are also hidden dangers that could be putting them at risk — toxic chemicals showing up in a product firefighters use to do their jobs. State officials stopped by the Bonita Springs fire training facility earlier Tuesday morning, making plans to test for toxic chemicals found in some firefighting foams used at training facilities. The contaminants can seep into the ground and water causing health concerns. When North Collier firefighters train, they use soapy water to spray from hoses rather than the chemical foam used to put out active fires. And it may save lives as well. Many firefighting foams include per- and polyfluoroalkyl substances (PFAS), synthetic chemicals that have been linked to cancer, thyroid disease, and other health issues. Cunningham says, fortunately, it’s good they didn’t expose the firefighters to that agent during the training exercises. In Bonita Springs, the fire district doesn’t train with the foam any more, but it did in the past. So did many others across the state and country. Now, the Florida Department of Environmental Protection is testing more than two dozen training facilities for signs of contamination. Bonita Springs Assistant Fire Chief Greg Dewitt is hopeful his training center will be in the clear. Either way, he’s ready to act. The DEP already found PFAS contamination at the Florida State Fire College in Ocala. Several firefighters and employees who worked at the fire college have filed a lawsuit against makers of the foam. Most are sick with serious diseases, and they blame PFAS exposure. In the lawsuit, they claim blame PFAS exposure for causing their sickness. For its part, the EPA plans to begin regulating the chemicals by the end of 2019. You can watch the EPA’s press conference on PFAS, from February 14. Many states aren’t waiting for the EPA to take action. A few states passed laws last year to ban or at least regulate these toxic chemical, and right now lawmakers in more than a dozen states, including Florida, are considering legislation to do the same. Meanwhile, some manufacturers have come out with replacement chemicals, but they are now showing up in the environment, too. The EPA is currently assessing how toxic those might be to humans. The DEP is expected to return to the Bonita Springs fire training facility later this month for testing. But keep in mind, it’s not just PFAS chemicals that firefighters are exposed to. Smoke contains many other hazardous chemicals like carbon monoxide and hydrogen cyanide. Lehigh Acres Fire Chief Robert Dilallo has seen it all in his 28 years in the fire service. “Each and every time you go to a firefighter funeral that’s died from cancer, it’s heartbreaking,” Dilallo said. His heart also breaks for the families. He knows what they are going through. At age 30, Dilallo was diagnosed with bladder cancer – just a month after his son was born 20 years ago. “The things that go through your head,” Dilallo said. “The things you start thinking about at that time is – am I gonna die? Am I gonna make it through this? What’s my wife gonna do? What’s my family gonna do? Who is gonna provide for them? “And I think that’s why this bill is so important,” Dilallo said. He’s one of the lucky ones. After surgery, he was back on the job within weeks. He has been cancer free ever since. But, many others do not make it. Rows of boots represent firefighters who died from cancer or are currently battling the disease. They were on display at the Capitol in Tallahassee earlier this month. It was the same time state lawmakers were considering a bill to give firefighters more cancer coverage, disability and death benefits. Many states already have a law in place – Florida does not. 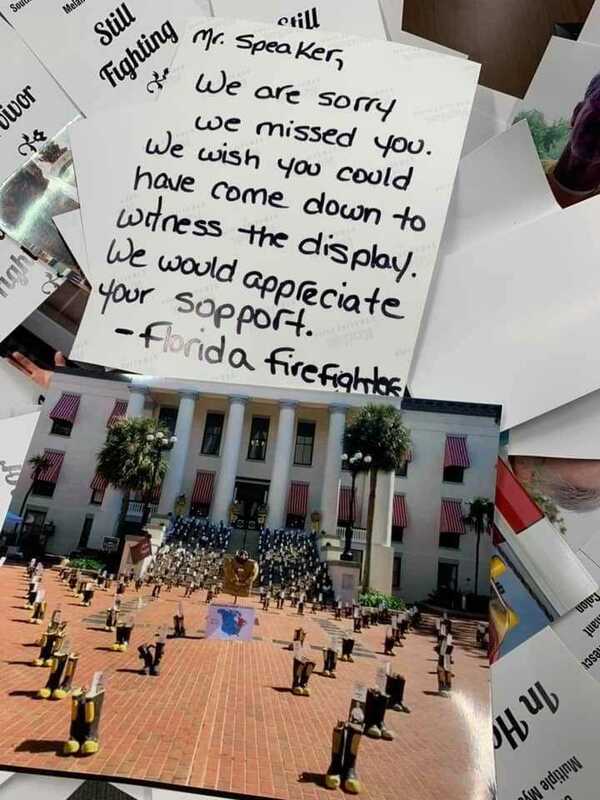 “For the families to is the big deal because a lot of times when a firefighter dies in the state of Florida their families are left with almost no coverage because it isn’t considered a line-of-duty death,” said Heather Mazurkiewicz, assistant state director in the Florida chapter of Firefighter Cancer Support Network. Statistics show firefighters not only have a higher risk of getting cancer than others, but also a higher risk of dying from it. Within the past year, fire departments across Florida also started decontamination efforts on the scene to help remove the hazardous chemicals they are exposed to regularly. In North Naples, the gear, as well as the ice machines and water fountains, are kept separate in air-conditioned rooms away from the truck’s diesel exhaust and other carcinogens. Dillalo said his firefighters must also shower within an hour of returning from a fire. He is hopeful these changes, along with more cancer coverage, will help keep firefighters alive. Dillalo is counting on it. He has two children who are now grown. His son recently became a firefighter, following in his dad’s footsteps and sharing his love of service. Did not respond to emails or calls.